Tucked away behind the International Museum of the Horse at the Kentucky Horse Park is the Clinician Corral where a variety of equine clinicians are holding clinics during the Alltech FEI World Equestrian Games. 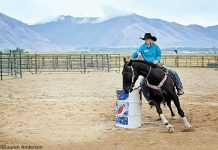 Some of the biggest names in the horse business are scheduled to appear in the Clinician Corral during the Games, including Stacy Westfall, Lynn Palm, Richard Shrake, John Lyons and Clinton Anderson. On Tuesday, I snuck away from the Horse Illustrated booth to watch one of the pioneers of natural horsemanship in action—Pat Parelli. Pat is the ultimate entertainer; completely comfortable in front of a crowd. At first Pat talked about why horses can be scared of humans. “We’re predators. Horses shouldn’t trust us,” explained Pat. “Too many horses are turned into slaves and robots because of overtraining.” Pat invited three of his students into the arena to work with their horses with long ropes and carrot sticks. They immediately started playing several of Pat’s famous Seven Games. They started with the Friendly Game and began rubbing their ropes all over their horses and swinging their ropes around in the air to desensitize their equine partners. “We have to show the horse that we mean him no harm,” explained Pat. Pat feels that doing groundwork is an important part of training a horse. “You start off by having little conversations with your horse on the ground. Work on behavioral problems from the ground, not in the saddle,” he says. “I believe in foundation before specialization,” explained Pat. Pat believes that every horse needs to know the basics and then they can go on to any discipline and be successful. Whether you intend to do dressage with your horse or cut cattle, your horse needs to know how to move away from a slight nudge of your leg or react to a tiny shift in your body weight. Pat then showed off a bit by demonstrating piaffe, a top-level dressage move, on Magic! Pat’s students hopped in their saddles and we were given a demonstration on how patterns feature strongly in his teaching. His students worked in a cloverleaf pattern for several minutes. Then he asked them to ride with their arms crossed across their chests. No problem. All of the horses continued on the cloverleaf patter at the jog and lope. Pat then invited one of his star pupils into the arena. Canadian para-equestrian Lauren Barwick won an individual gold medal at the 2008 Para-Olympics in para-dressage and she is a member of the Canadian para-equestrian team. She and her 16-year-old Dutch Warmblood mare, Maile, will compete at the Games. 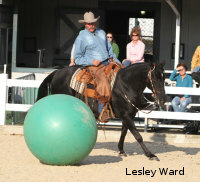 In 2000, Lauren was injured in a ranching accident which left her paralyzed from the waist down. After nine weeks of rehabilitation, Lauren was back in the saddle. Soon after, she moved to Colorado and began studying the Parelli methods of training horses. Lauren treated the crowd to a short dressage freestyle display to music and performed movements including leg yields and spectacular extended trots. Lauren was not the only Parelli student at the clinic—two Lexington mounted police offers were watching the clinic from the backs of their sturdy Percheron crosses. Both officers and their horses were graduates of the Parelli program. To learn more about Pat Parelli, visit www.parelli.com. 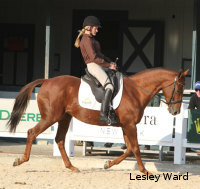 To learn more about para-equestrian Lauren Barwick, visit www.ridingforgold.com. To learn more about the 2010 Alltech FEI Games, visit www.alltechfeigames.com. Next articleIs it Always Good to Go Green?